Earlier this summer I got to spend some time in the southwest of the US, and that trip inspired the Capulin Cross Body Bag! 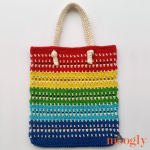 The Capulin Cross Body Bag is made using the tapestry technique – you crochet over the unused yarn, and then switch colors (repeatedly) over the course of each round, creating images and shapes! I’ve got a tutorial for the tapestry technique below. 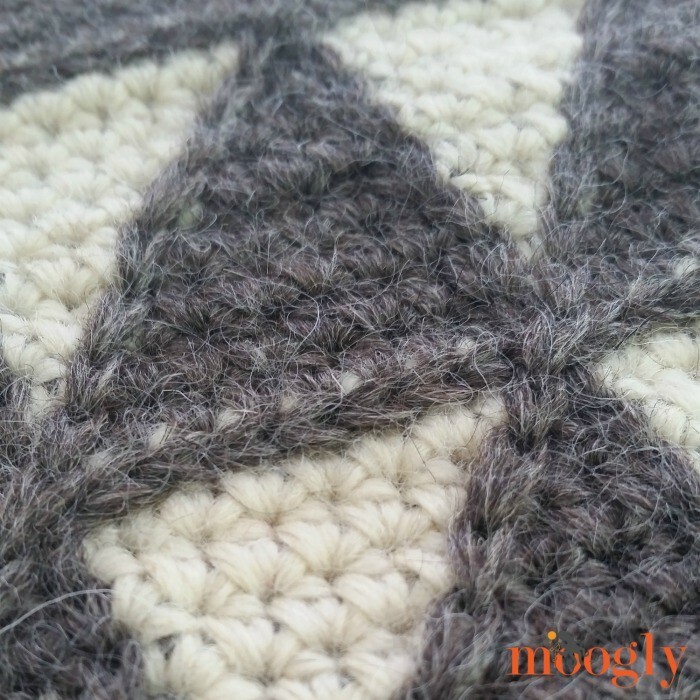 One touch I added – surface crochet along all the straight lines, to really sharpen up the triangles! I think it gives this pattern a more polished look – one you can omit if you prefer! 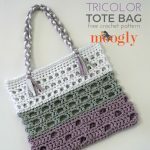 NOTE: This pattern using tapestry crochet techniques. 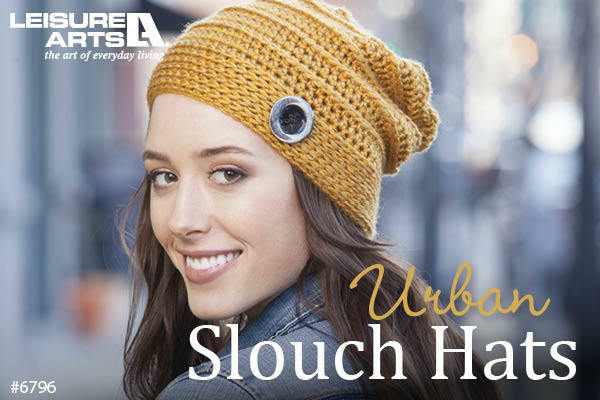 To switch colors, finish the previous stitch (the final yo and pull through) with the new color. Crochet over the unused color. See the above linked tutorials for a demonstration of this technique, and the other techniques used in this pattern. Round 2: Ch 1, *with CA hdc 7, with CB hdc 1; repeat from * around, join with CA. Round 3: Repeat Round 2; join with CB. Round 4 and 5: Ch 1, with CB hdc 1, *with CA hdc 5, with CB hdc 3; repeat from * around, finishing last repeat with CB hdc 2, join with CB. Round 6 and 7: Ch 1, with CB hdc 2, *with CA hdc 3, with CB hdc 5; repeat from * around, finishing last repeat with CB hdc 3, join with CB. Round 8: Ch 1, with CB hdc 3, *with CA hdc 1, with CB hdc 7; repeat from * around, finishing last repeat with CB hdc 4, join with CB. Round 9: Repeat Round 8; join with CA. Round 10 and 11: Ch 1, with CA hdc 3, *with CB hdc 1, with CA hdc 7; repeat from * around, finishing last repeat with CA hdc 4, join with CA. Round 12 and 13: Ch 1, with CA hdc 2, *with CB hdc 3, with CA hdc 5; repeat from * around, finishing last repeat with CA hdc 3, join with CA. Round 14: Ch 1, with CA hdc 1, *with CB hdc 5, with CA hdc 3; repeat from * around, finishing last repeat with CA hdc 2, join with CA. Round 15: Repeat Round 14; join with CB. Round 16: Ch 1, *with CB hdc 7, with CA hdc 1; repeat from * around, join with CB. Round 17: Repeat Round 16; join with CA. Round 18 – 33: Repeat Round 2 – 17. After Round 33, break CB and continue with CA. Round 34: Ch 1, hdc in each st around; join. Round 36 – 38: Ch 1, sc in each st around; join. Round 39: Repeat Round 34. Round 40: Ch 1, sc in 3rd loop of each st around; join and break CA. 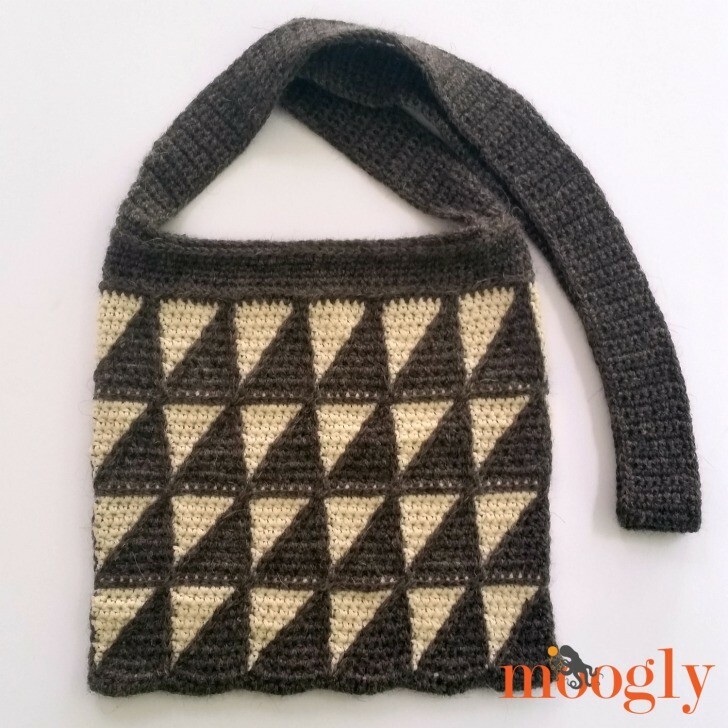 Optional: Use CA and surface crochet to outline triangles. As shown, all vertical lines were added, then horizontal lines, then diagonal lines. Use st markers to decide placement of strap before you begin. As shown, strap is 7 sts wide. Join with CA to first marked st of one side and sc in rows to desired strap length. As shown, strap is 45″ long. Sew strap to opposite side of bag (at marked sts). Edge strap and top of bag by working sc sts evenly along sides of strap and sl sts along top of bag between ends of strap. And that’s the Capulin Cross Body Bag! I hope you enjoyed making it! Of course, you can line it, add snaps or a zipper, or dress it up however you like – I can’t wait to see how yours turns out! Wow, I haven’t heard of this technique before. It looks amazing though, I think I will try it out sometime soon 🙂 And the bag is so pretty! 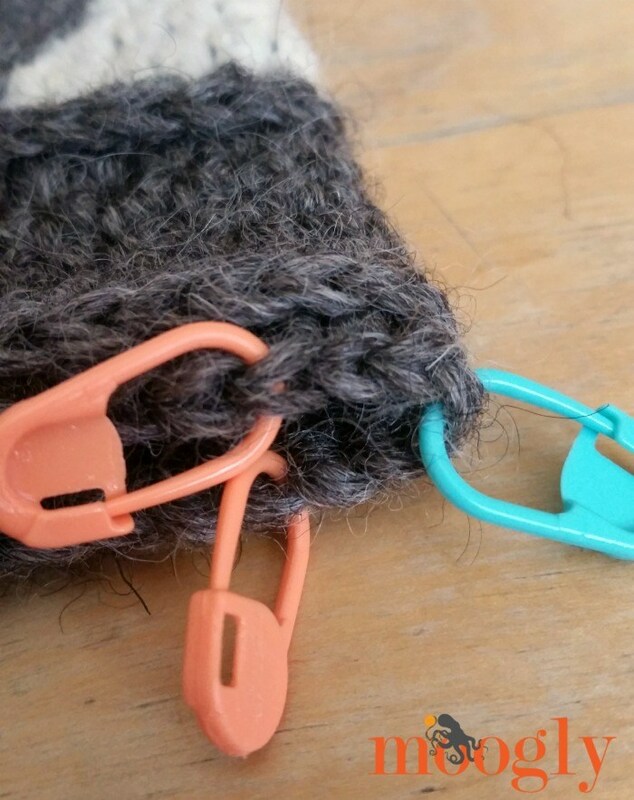 If I want to make this from a lighter weight yarn, what is the multiple for the beginning chain? please add my name to your mailing list. Thanks. 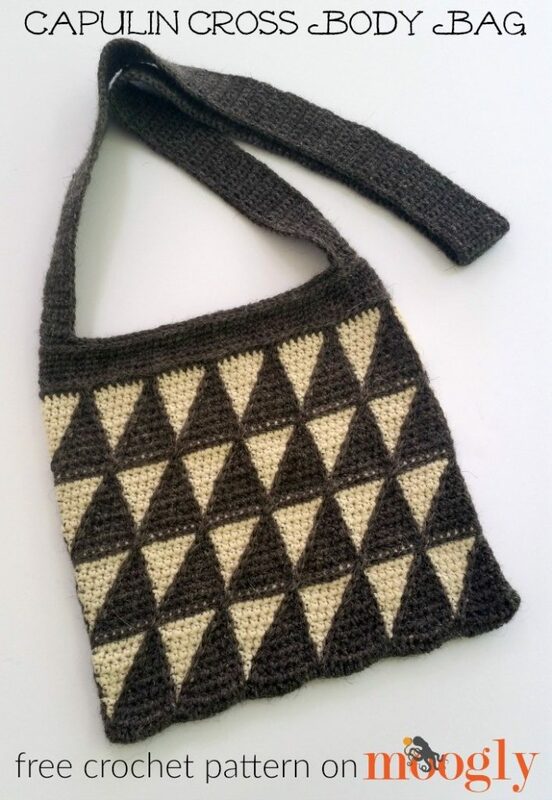 on your capulin cross body bag is it ok to have only 5 triangles instead of 6 like the picture? ok thank you for your help on this pattern. I am likeing this pattern and a hole lot and I am makeing the triangles bigger so my friends could see them better.and the colors are warm Brown and Natural. Always brilliant and creative patterns! Thank you so much!!!!!!! Been to Cspulin, so know exactly what your inspiration is! Cool! I grew up in the country South of Capulin Mountain, New Mexico. Beautiful inspiration. I haven’t tried tapestry crochet yet but I’m going to now!! !